My eyes were closed as Jordan held my ear in his hand, cradling it as though it were especially precious to him, and drew the constellation of Scorpio around the rim. He cradled it as though it were precious to him because it was: it was a blank canvas. “I can really tell how passionate you are about what you do,” I said through a big grin. “Thank you.” He paused for a moment as he concentrated on my ear. I could feel him smile, heart pouring over his pen. I specifically wanted Jordan to tattoo me because when I met him, I knew that a tattoo session with him wouldn’t just be a tattoo session- it would be a healing, as well. Perhaps they call it “Sacred Expressions” for that exact reason. Listening to him talk, I could feel the room raise in temperature. A wash of marigold light swept the space, emanating from his entire being. I felt safe. After I had checked out and approved the freehand, I got back on the table and closed my eyes. I meditated through the majority of the work, focusing on the integration of this new, physical pigmentation of skin into my body, and the integration of all of the energy that it represented to me in to my cells. The needle was soft and relaxing. I was focusing on its vibration, how even though it was a mechanism for integration, perhaps it was also a tool for cleansing and clearing- breaking up stagnancy between cells, cleaning away DNA imprints of things I didn’t want to remember to hear anymore; allowing for new things to come; for new whispers to make themselves known. It truly was self-care: putting this image of such a huge part of myself (literally almost half of my chart is in Scorpio) physically on myself at such a poignant time in my life, and having the space held for me to be able to do that in such a powerful and delicate way. And on top of that, it was like- knowing it or not- Jordan was helping to guide and smooth the energy around, his hand warm like a brother’s: soft and full of love. I felt like I was in a cocoon. Like I was there silently expressing myself, and I was allowed all of the space and time that I needed. After a while when he could sense I was coming back into the room a bit more, he spoke. 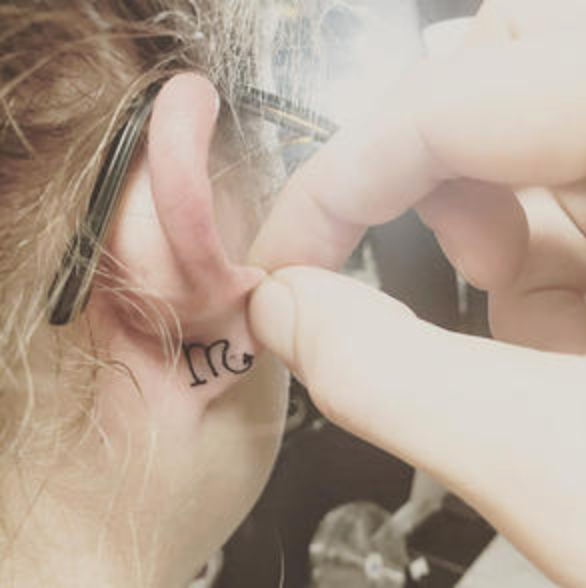 “So Scorpio, huh?” By this time he had moved to the back of my earlobe and was starting to tattoo the “M” with the tail symbol there. 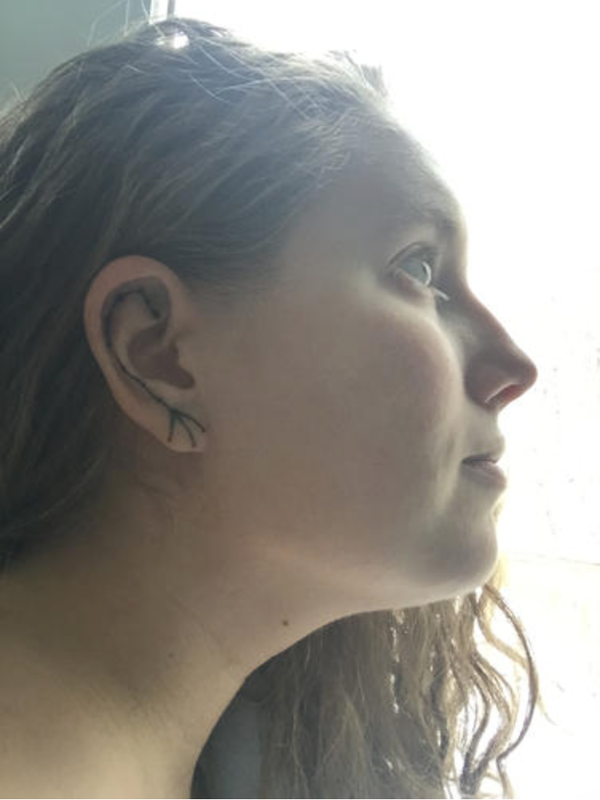 “You said you teach classes on astrology?” he asked as he folded my ear a little more to get a different angle, gently manoeuvring his fingers as though working with a delicate fabric. We both sat with those ideas for a while. That was such a huge reason why I was doing this. I really need to look like myself, instead of just merely feeling it. He stopped the buzzing and gently wiped my ear. “Oh heck yea.” I slowly pulled myself up from the table, feeling strong in a new way, and I went and looked in the mirror to see myself in exactly the way that I had been dreaming of.